Teeger Schiller Inc. is proud to be publishing a monthly column in Graphics Arts Magazine. 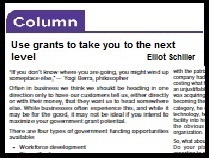 These columns, as requested by the publisher, are targeted at Canadian Manufacturers with the objective of informing them of and keeping them abreast of any opportunities within either the Federal Government, or the various Provincial Governments with regards to grants, loans, research support, and marketing support. Are you in the process of upgrading your technology to stay competitive? If so, it's that time of year again when skilled postsecondary students become available to join the workforce. There's a wage-subsidy initiative that can help you hire them. Read on. 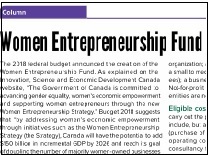 The federal government is making funding available through the Women Entrepreneurship Fund, with the objective of providing support to women to grow their businesses and facilitate their pursuit of opportunities in markets abroad. Title: Futurpreneur - is it for you? 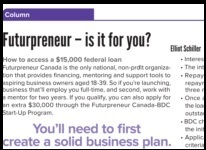 Futurpreneur Canada is the only national, non-profit organization that provides financing, mentoring and support tools to aspiring business owners aged 18-39. If you qualify, you could be eligible for as much as $45,000. Ontario provides funds to support projects that create jobs, encourage innovation, collaboration and cluster development, and attract private sector investment. Could this change your too costly project into an attractive ROI, and take your business to the next level? Learn more. 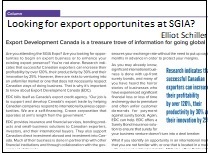 Title: Looking for export opportunities at SGIA? Are you looking for opportunities to begin an export business or to enhance your existing export presence? There are risks to venturing into an unfamiliar market or one that does not necessarily respect Canadian ways of doing business. 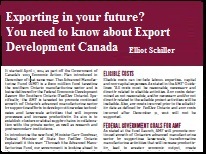 That is why it's important to know about Export Development Canada (EDC). 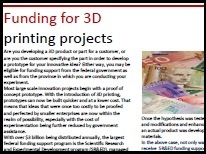 Just in time to help you upgrade your shop and employee skill levels, many provinces have upped their support for research and development, venture capital funding, and training support. 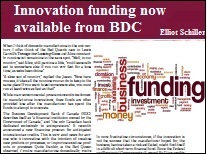 This article looks at new or improved funding support from the provinces. for research and development. 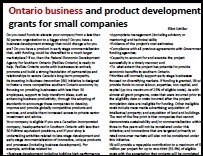 These programs support small to medium sized enterprises, with the objective of increasing their capabilities to develop and commercialize their innovations. Just recently, Innovation, Science and Economic Development Canada announced that it will provide $950 million to five innovation superclusters spaced evenly across the country. Is your business getting its share of available funding? Are you just starting a business in the or are you ready to take your business to the next level? 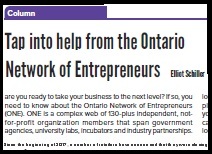 If so, you need to know about the Ontario Network of Entrepreneurs (ONE). ONE is a complex web of 130-plus independent organization members aimed at supporting the growth of Ontario businesses at different stages of development. Often in business we think we should be heading in one direction only to have our customers tell us, that they want us to head somewhere else. While it may be for the good, it may not be ideal for maximizing government grants. 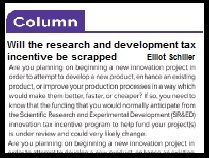 Are you planning on beginning a new innovation project in order to develop a new product, enhance an existing product, or improve your production processes in a way which would make them better, faster or cheaper? Then this column is a must read, and the sooner the better. As the tax filing season is here once again, it is time to think about how best to maximize your financial wealth. This article provides tips for taxpayers of all ages, all income brackets, married or single, and of course, with different savings objectives. Do you want to expand your workforce but recognize that you will incur substantial skills training costs? This spring, the Government of Canada introduced the Career Focus Program to provide funding for employers to design and deliver a range of activities that enable youth to develop career required skills. Would you benefit from a skills upgrade program in your shop? 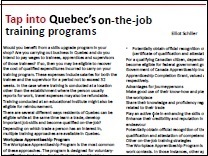 Are you carrying out business in Quebec and do you intend to pay wages to trainees, apprentices and supervisors of those trainees? If so, then you may be eligible to recover the cost of qualified expenditures incurred to carry on your training program. Do you need funds to elevate your company from a less than 50 person organization to a bigger shop? Do you have a business development strategy that could change who you are? 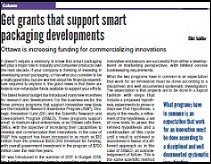 Do you have a product that is ready for commercialization? 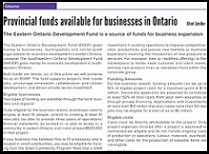 If so, then the Federal Economic Development Agency for Southern Ontario (FedDev Ontario) is ready to help. 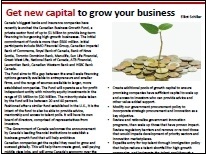 Canada’s biggest banks and insurance companies have recently launched the Canadian Business Growth Fund, a private-sector fund of up to $1 billion to provide long-term financing to burgeoning high-growth businesses. The Fund aims to fill a gap between the small-scale financing options generally available to entrepreneurs and smaller firms, and the range of sources available to larger, more established companies. 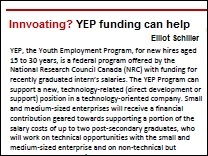 YEP, the Youth Employment Program, for new hires aged 15 to 30 years, is a federal program offered by the National Research Council Canada (NRC) with funding for recently graduated intern’s salaries. The YEP Program can support a new, technology-related position in small and medium-sized enterprises supporting a portion of the salary costs of up to two post-secondary graduates. We’ve all heard the word, crowdfunding, but does it really apply to our business? 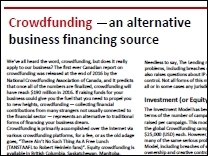 The first ever Canadian report on crowdfunding was released at the end of 2016 by the National Crowdfunding Association of Canada, and it predicts that once all of the numbers are finalized, crowdfunding will have reach $190 million in 2016. If raising funds for your business could give you the fuel to propel you to new funding, this article is for you. Are you searching for a long-term financial solution for your business? There are many options with respect to equity investors to bank on your potential, provided either by government funded or sponsored solutions. These funds each have specific criteria that determine eligibility. 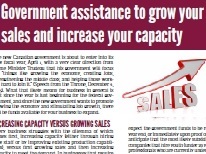 The Government of Canada has a detailed listing of every program which can be found in this article. 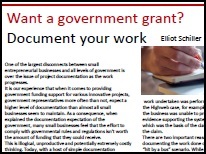 One of the largest disconnects between small entrepreneurial businesses and all levels of government is over the issue of project documentation as the work progresses. As a consequence, many small businesses feel that the effort to comply with governmental rules and regulations isn't worth the amount of funding that they could receive. This is illogical, unproductive and potentially extremely costly thinking. 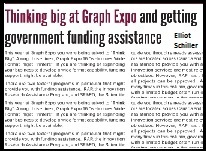 This year at GRAPH EXPO you are being asked to “Think Big”. Along those lines, Graphic Expo 16 “welcomes Wide Format Inkjet Printers”. If you are thinking of expanding your business to develop a wide format capability, funding support might be available. 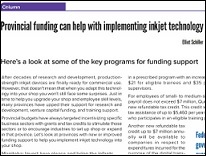 This article discusses the two federal programs in particular that might provide you with funding assistance, IRAP and SR&ED. Many innovation projects begin with proof of concept prototypes. With the introduction of 3D printing, prototypes can now be built quicker and at a lower cost. That means that ideas that were once too costly to be proofed and perfected by smaller enterprises are now within the realm of possibility, especially with the cost of experimentation being further reduced by government assistance. .
Are you looking for funding to help advance your business? 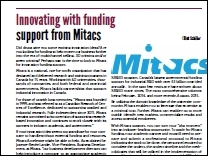 Perhaps now is the time to look to Mitacs for innovation funding support. Mitacs is a national, not-for-profit organization that has designed and delivered research and training programs in Canada for 15 years. 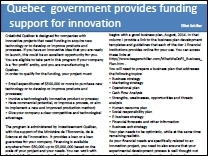 Working with 60 universities, thousands of companies, and both federal and provincial governments, Mitacs builds partnerships that support industrial innovation in Canada..
Créativité Québec is designed for companies with innovative projects that need funding to acquire new technology or to develop or improve products and processes. If you have an innovative idea that you are ready to launch, this could be an excellent opportunity for you. You are eligible to take part in this program if your company is a ‘for‐profit’ entity, and you are manufacturing in Quebec.. 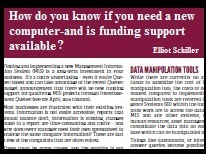 Title: How do you know if you need a new computer system-and is funding support available? Finding and implementing a new Management Information System (MIS) is a long-term investment in your business, and often, a costly undertaking. While most businesses are frustrated with their existing systems, there could be many causes, and the solution is not necessarily the implementation of a new system. 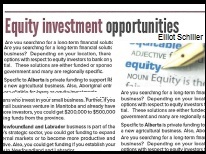 This article explores various alternatives and discusses funding help that is available. 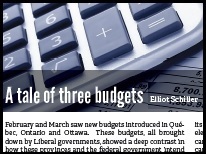 February and March saw new budgets introduced in Québec, Ontario and Ottawa. These budgets, all brought down by Liberal governments, showed a deep contrast in how these provinces and the federal government intend to incentivize manufacturing going forward. To summarize, Ontario cut incentives to domestic manufacturers, Québec created new incentives, and Ottawa said details will come soon. Here’s some good news for companies contemplating expanding to new markets internationally. 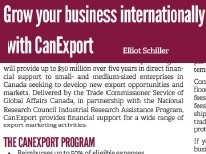 The Government of Canada’s newly announced CanExport Program will provide up to $50 million over five years in direct financial support to small and medium-sized enterprises in Canada seeking to develop new export opportunities and markets. The new Canadian government is about to enter into its new fiscal year, April 1, with a very clear direction from Prime Minister Trudeau that his government will focus on “things like growing the economy, creating jobs, strengthening the middle class, and helping those working hard to join it.” This article and spreadsheet help you determine your ROI. See spreedsheet at Graphic_Arts_Spreadsheet. 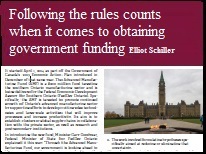 This is the third part in our three part series about the October federal election. The people of Canada have spoken. The Liberals, after a brilliantly run campaign, have been awarded a majority government, just four years after being relegated to the third place party. So, what changes, with respect to existing government programs, that support business growth, are we likely to see, and what new programming directions are possible?. 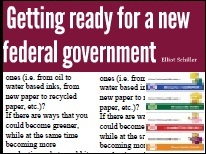 This is the second in our three part series about the October federal election. In this column, we focus on what funding help we can expect to be available based on each party's published platform. Suggestions about what opportunities might become available with respect to innovation, skills training, new hire support and investments in green technologies are discussed. Federal elections and the possible changes they can elicit, are important to your business, as future corporate taxes, government spending direction, and government philosophy have both a real and a perceived effect on the business climate in which you operate. 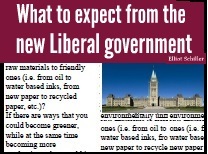 This article will exam each parties' policy / platform documents. The October issue will focus on what funding help might be available based on these platforms and the likely outcome of the election. Canada Revenue Agency (CRA) has revised its Eligibility of Work for SR&ED Investment Tax Credits Policy with significant new “clarifications”. For the first time since the program was introduced in 1992, the term scientific method no longer applies to the SR&ED program. In what this author considers a confirming acknowledgement of the shop-floor practices of the domestic manufacturing sector, CRA now refers to the proper method of attempting product or process improvement as systematic investigation, not scientific method. Title: Disagree with GST and other tax owing issues? You can informally appeal! As part of the controversial Omnibus Bill introduced by the Harper government in the fall, 2013, was an increase in the “amount in dispute” up to $50,000 for GST/HST appeals, and up to $25,000 for many other tax disagreements. That is significant, and probably a large enough amount to enable most small to medium size companies (SME’s) to fight what they are confident represents an incorrect or unfair ruling by Canada Revenue Agency (CRA). encourage employers to improve the skill levels of their employees. A cynic might say it’s being ramped up because this is an election year. Nevertheless, from a business perspective, when was being granted up to $12,500 per employee to make your employees even more valuable to your company ever a bad thing?, read on! 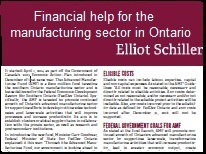 Elliot Schiller recently attended a Public Works and Governmental Services Canada seminar discussing the federal Built in Canada Innovation Program (BCIP). BCIP's stated objective is to help Canadian businesses bridge the pre-commercialization gap that many of them face in moving innovation from the laboratory to the marketplace. If you have recently developed a new product or enhanced an existing product, read on! 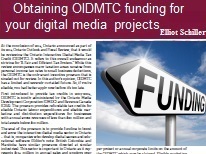 At the conclusion of 2014, Ontario announced that it intended to review the Ontario Digital Media Tax Credit. Makes sense, a program that was originally intended to boost and grow the interactive digital media sector in Ontario has now turned into a $100 Million funding giveaway, for an industry estimated at less than $200 Million in sales. If you have a website with interactive capability, this is a must read article. Hurry, before it's too late! Maintaining a manufacturing presence in Canada requires constant innovation to remain competitive. 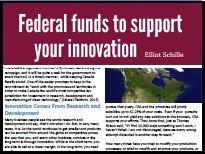 Canada considers itself one of the most generous countries in the world with respect to funding R&D. 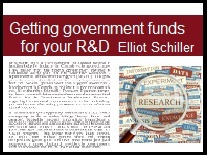 However, those funds are provided many months to a year, after the R&D costs have been incurred. Now, BDC, the Business Development Bank of Canada is giving advances on those funds, without any affect on your existing credit thresholds. Good news! 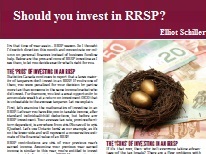 Title: Should you invest in RRSP? 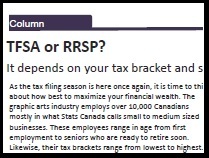 It's that time of year again – RRSP season. So we thought we’d switch direction this month and concentrate our column on personal finances instead of business funding help. Below are the pros and cons of RRSP investing as we see them, to let you decide exactly what’s right for you. The Temporary Foreign Worker Program has certainly been in the news of late. 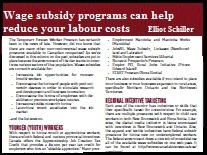 However, there are many other non-controversial wage subsidy programs available to Canadian companies. Federally,programs help youth find employment, encourage hiring for innovation, commercialization and expansion. Provincially, there are many programs that target issues of concern in that region. See if you qualify for Funding Help when you are ready to hire. Many in the business world think that the rules are just guidelines with respect to how to apply for funding from a government body. That couldn't be further from the truth. This article provides an example of a major manufacturer who didn't follow the rules, almost wound up in Tax Court, but for whom we were able to obtain a "second" chance from Canada Revenue Agency and avert a court case. Export Development Canada (EDC), based on its most recent published figures provided assistance to over 7,400 Canadian companies doing business in 187 countries. This article briefly touches on the various ways that EDC could potentially help your business, including protection against risk, freeing up of working capital, supporting business growth, investing in foreign markets and obtaining financing If exporting is in your future, this is a must read. 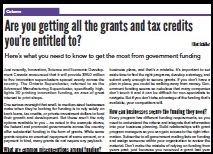 This article discusses the various topics and the content within that need to be included in an effective business plan that will improve your ability to obtain funding, be it from a federal or provincial government, a financial institution or a private lender. Each of the big five banks provide you with a free of charge template to create a business plan. As part of the Economic Action Plan, 2013 is a $200 million fund targeting Southern Ontario to promote continued growth in the advanced manufacturing sector by supporting efforts to develop cutting-edge technologies and large-scale activities that will improve processes and increase productivity in order to establish clusters or global supply chains in collaboration with the private sector, and research and post-secondary institutions.. 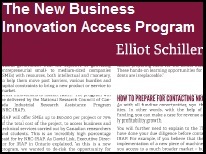 The newly announced Business Innovation Access Program (BIAP) is a $20 Million funded program from the federal government with the objective of providing entrepreneurial small to medium sized companies (SMEs) with resources, both intellectual and monetary, to help them move past barriers, hurdles, and capital to bring a new product or service to market. See if you are eligible and how to proceed if you are. 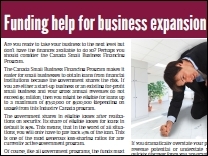 The Canadian Small Business Financing Program makes it easier for small businesses to obtain loans from financial institutions because the government shares the risk. If you have an idea that can take your business to the next level, but lack the funds, read on. This article lists what to prepare before you meet your financial institution. Remember, you only get one chance for a first impression, so, make sure you are ready when you approach your banker. 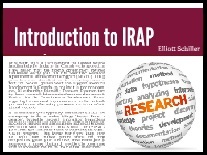 IRAP, the Innovation Assistance Program, offered by the National Research Council of Canada, and funded by Industry Canada consists of various difference financial assistance programs for qualifying companies. Currently there are funds available to support research and development innovation, youth employment, and digital technology adaptation. 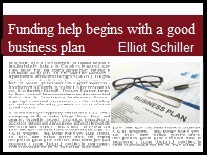 This is the first article in the new Funding Help column written by Teeger Schiller Inc. Director, Elliot Schiller. 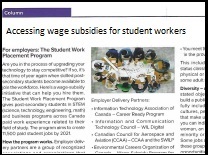 Appropriately, this article focuses on the SR&ED program, Canada's largest support program for the manufacturing industry with $6 Billion per year being awarded to qualifying companies. Enjoy!